Final Inspection to Ensure Your Satisfaction! ServiceMaster by Marshall removes thousands of spots every year. Quick action may prevent a long term problem. Call ServiceMaster by Marshall today before too much time turns that spot to a permanent stain. Heavy use of Upholstered furnishings causes soil and dirt to dull appearance. ServiceMaster by Marshall technicians restore your furniture’s appearance through initial vacuuming and spot treatment, cleaning, rinsing, water extraction and washing and polishing frames. One of the biggest challenges with tile flooring is keeping the grout clean. Porous grout traps dirt over time, causing a dull and sullied in appearance. ServiceMaster by Marshall ’s tile and grout cleaning process gets the grout clean and keeps it looking its best. Our tile and grout cleaning process is very effective on both ceramic and porcelain tile and is ideal for kitchens, baths, countertops and other tiled areas of your home. A clean duct system is essential to the quality of the indoor air your family breathes. Our HVAC Cleaning system collects pollen, spores, dust and debris from your air supply system. An annual deep cleaning of your home can remove the build- up of dust and grime on your walls, chandeliers, windows and other hard to reach places. 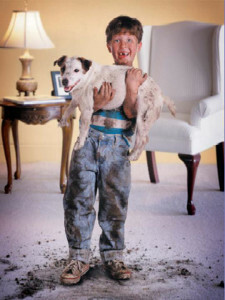 Combine this service with our carpet and upholstery services, and your home can be cleaner than the day it was built.